It has been cold and rainy the last few days–typical of a Rocky Mountain spring–and all I want to do is snuggle up with a blanket, a book, and a big bowl of soup. This concoction fit the bill perfectly. I know the typical split pea soup is all smooth and pureed, but I was a) too lazy to wash the blender and b) not really feeling the dirty-olive-green color it would become. 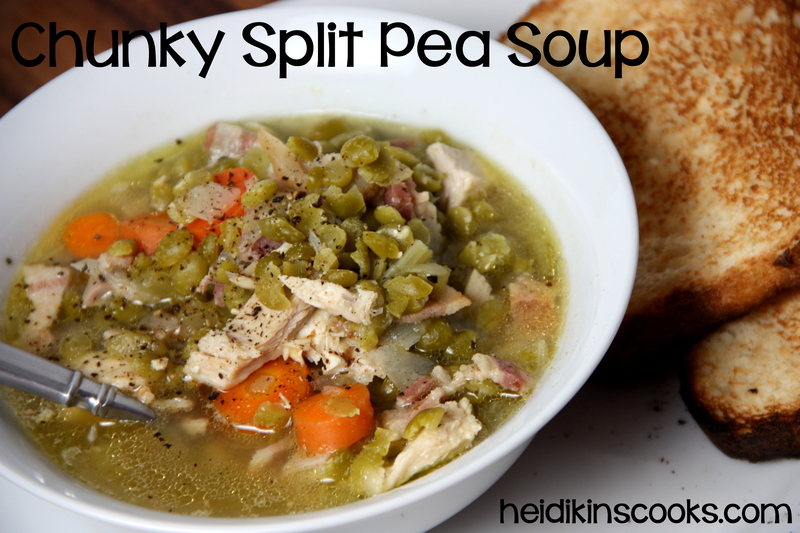 So, chunky soup it is! I liked having something to sink my teeth in to. If you wanted to bulk this up even more you could add a few potatoes, or some diced up ham, or whatever. Chop the bacon and cook in a large stock pot until crispy, add onion, garlic, celery, carrots and sauté until the onion and celery are soft. Add peas, water, (potatoes), and bay leaves. Bring to a boil and simmer 30 minutes, add the cooked chicken or turkey and simmer another 15-20 minutes until peas are soft and chicken is heated through. Test for salt, add if necessary. Serve hot with crusty bread, cracked black pepper, and sour cream if you want. You can puree this whole thing in a blender or with an immersion blender, but I kind of like it chunky. It seems more like soup and less like brown-green sludge.